Congratulations on making the decision of getting a new puppy, but make sure you don't get caught unprepared when you first bring your puppy home. A new puppy checklist is a must so that you are good to go on your new adventures and you are more likely to succeed in helping your puppy learn and grow to his full potential. Let's face it: If you are a parent, you have most likely spent loads of time preparing for your newborn baby's arrival: the nursery room was decorated in advance, you stocked heavily on supplies ensuring to never run out of diapers and wipes and you have likely spent hours on end on shopping for onesies, baby bottles and cribs. Same goes for weddings: You likely have spent evenings shopping for the best wedding dress, cake toppers and you may have even sent out oodles of invitations. You likely have also worked hard to ensure your new home had all the essentials to make your life and the life of your new spouse as cozy as possible. But what about preparing for the arrival of a new puppy? Many novice puppy owners miss so many things that would have made life with their pups so much easier. Don't make this costly mistake which can lead to frustration and even resentment, especially in the potty training department. For instance, I often encounter new puppy owners who have no clue about using the right products for cleaning up puppy messes. Failure to use the right products leads to much frustration as some products are known to work as "attractants"—evoking the pup to go pee and poop on the areas recently cleaned with these products. How frustrating is that? Not to mention, the importance of management tools. 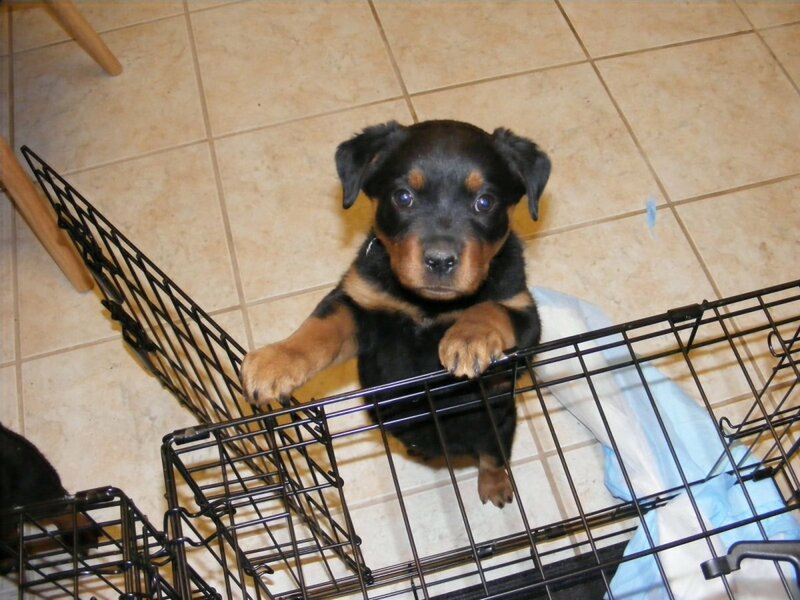 A crate, exercise pen or baby gate can make a world of difference and aid in preventing the rehearsal of troublesome behaviors that many new puppy owners may find unnerving. The wise perspective puppy owner will, therefore, know the importance of advance preparation and will make sure to not miss anything on his/her new puppy checklist. Before opening your heart and home to a new puppy, you'll need several supplies. While this checklist may seem like lots of puppy stuff at first, you'll be thanking me later on once your puppy will be much more comfortable and happy compared to your neighbor's pup who has still not been potty trained 6 months later. Following is an important new puppy checklist to help your pup adapt to his new living quarters and get started in successful potty training. Crate: A crate is short-term confinement area. It is not meant to keep your pup parked in there for hours on end. Pups are social creatures and isolation leads to problems. A crate works best if you are home most of the day and you can monitor your puppy. Your puppy will need to be taken out of the crate very often to eliminate and you will need to become acquainted and watchful for signs of your puppy needing to go potty. Very young puppies may need to be taken out to potty every 1 to 2 hours when awake and at least 2 to 3 times a night/early morning. A crate facilitates your puppy's potty training because its use is based on a pup's instinct to not want to soil the area where he sleeps. Now, this instinct is strong in most pups raised by a reputable breeder, while it is very weak instead in puppy mill dogs and pups sold in pet stores. In order to work well though, the right choice of a crate is important. Make sure the crate is large enough that your pup can comfortably stand, turn around and stretch his legs when sleeping, but snug enough that he can't potty in one corner and rest comfortably in the opposite end. A crate also helps keep your puppy safe when you can't actively supervise him. A crate should never be used for punishment as we want the pup to love being in there and never dread it. You can use a crate for time-outs for when your pup misbehaves or is cranky, but punishment is needed: just calmly and matter-of-fact lead your pup in the crate with a treat and a chew toy and let him calm down. Your puppy will be invited into the crate from day one. Make sure you keep the door open and place some toys and treats inside. Praise your pup for exploring it. Encourage repeat visits and praise lavishly. When night-time comes, you will have your pup sleep in the closed crate in your bedroom. You pup needs your reassurance during this time as he'll miss his mom and siblings and may feel lonely. If your breeder supplied you with a blanket or stuffed animal that smells like his previous home, let your pup sleep next to it. As your pup starts adjusting more and more to you and your new home, if you wish, you can start moving the crate a little bit more each day towards a destined area, but you still want to be able to hear your pup should he be asking to be taken out to potty at night and early morning. If you plan on having your pup sleep in the crate at night in your bedroom indefinitely, you may find it more feasible to purchase two crates, one for the night and one for the day in the living area so that you won't have to lift a heavy wire crate each day. X-pen: Also known as an exercise pen, an X-pen is a long-term confinement area that works best for those folks who are potty-training a puppy when working all day. Inside the x-pen, new puppy owners can place, on one side, puppy pee pads or newspapers if they are planning on newspaper training their puppy, and on the opposite side, the food and water bowl strategically placed on one end with the pup's bed in the other end. Keeping the potty area away from the area where the pup eats, drinks and sleeps, is still based on a pup's instinct of not soiling near his eating and sleeping areas. In this case though, unlike the crate, the pup is encouraged to eliminate when he needs to by using the newspaper or pee pads. On top of this, an x-pen gives the puppy more room to stretch and play. Pup owners who do not wish to use a crate can use an x-pen. The main disadvantage though is that, since the pup has learned to eliminate whenever he wants and indoors, this can confuse the pup when later on, he's expected to learn to hold it and go potty outside. Enzyme-based cleaners: When it comes to cleaning products, the right products can make a whole world of difference. If you use ammonia-based products, these are a big no-no. Since urine has ammonia in it, ammonia-based cleaning supplies will encourage your puppy to soil over and over again in the areas you have cleaned up. This is because to a puppy, previously soiled areas or areas that smell like urine, attract him and tell him "this is your bathroom." Instead, you want to invest in enzyme-based cleaners because these products contain enzymes which break down and neutralize odors. Popular cleaning products for puppy accidents include: Anti-Icky Poo, Nature's Miracle and Urine-Off. Black Light: Although you may think you are judiciously cleaning up all your pup's accidents, sometimes you may miss some. This is often a problem with pint-sized pups such as toy and teacup puppies, runts of the litter or simply small-breed pups. These pups are hard to monitor all the time because they can easily sneak behind a table or couch and their pee accidents are teeny which makes them easy to miss. The issue of eliminating out of sight under tables and behind chairs is also common in puppies who hide to pee and poop because they have come to associate their owner's presence with punishment. A black light can, therefore, come to the rescue here. In order to use it, you will have to turn off all your lights and shine it around the house looking at carpets and other surfaces such as couches, walls and bedspreads. The blacklight will make urine glow so that you can clean them properly, preventing your pup from soiling over and over these areas since once clean, they will no longer smell like "bathroom." Paper towels to clean up messes. Puppy pee pads if you plan on using a long-term confinement area. Newspapers if you plan on newspaper training your puppy. Pooper scooper to easily clean up outdoor poop from the yard. Dog waste bags: to pick up poop in public areas. We have been using Nature's Miracle a whole lot to clean up messes from all the doggy guests we have had over the years at our boarding and training business. We trust this brand becomes it's been on the market for so long and our pups grew up on this product and were successfully potty trained. Of course, your growing puppy will need to eat in order to grow into a healthy and happy puppy. While these items may sound quite obvious, many new puppy owners make some deleterious mistakes when feeding their puppies and these mistakes can cause short-term of even long-term problems. Dog food: If you are planning on feeding a different food from the one your breeder was feeding, make sure that you transition your puppy gradually to prevent annoying tummy upsets which will put a dent in your potty training process. Read the label for info on how quickly to transition your new puppy to the new food. You may be amazed as to how much puppies need to eat! This is because they are at the peak of their growth and need all the nutrients they can get. Those growth spurts sure need fuel! 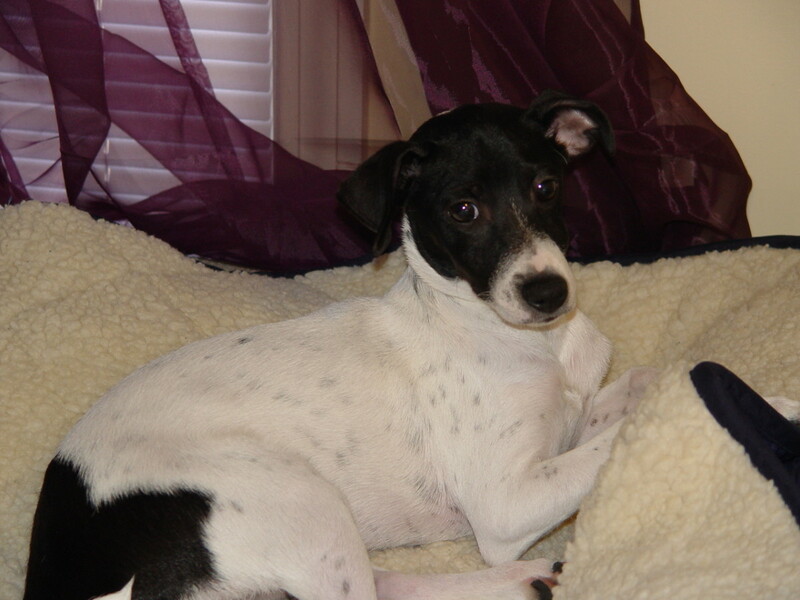 Speaking of nutrients, there are some things to be aware of at the delicate puppy stage. 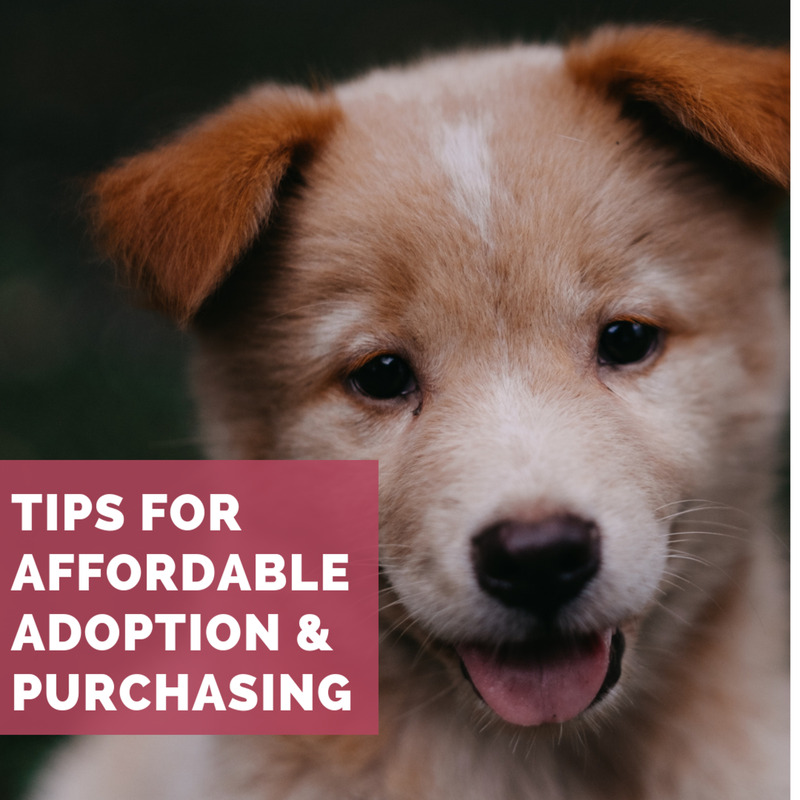 You will find that there are many puppy food choices when you visit your store, so it helps to do a bit of homework beforehand, so to narrow them down. You want to stick to dog foods that adhere to strict quality control standards and are labeled as complete and balanced, meeting AAFCO minimums and maximums. Caution is needed when picking foods for large breed puppies. Some dog foods may be dangerously high in calcium which makes them not suitable for large breed puppies. Veterinary nutritionist, Dr. Deborah E. Linder, suggests that owners of puppies expected to be close to or above 70 lbs as adults should look for look for puppy foods that specify to have a more narrow range of certain nutrients. The food label should specify something along these terms "[Pet Food Name] is formulated to meet the nutritional levels established by the AAFCO Dog Food Nutrient Profiles for growth/all life stages including the growth of large-size dogs (70 lbs or more as an adult)." Finally, what your pup eats has to come out, which translates into many potty trips. Yes, puppies are quite some pooping machines! Keeping your puppy on a feeding schedule, versus free-feeding your puppy with access to food all day, helps your pup have "predictable outings" which means you'll have an easier time in potty training. Food bowl: There are many makes and models of food bowls nowadays. For ease of convenience, you may want to pick a food bowl that is less resistant to being flipped over and moved around. Look for one that has a rubber base so to reduce noise and skidding, while also protecting your hardwood floor from scratches. The material of the food bowl also counts. If possible, skip the cheap plastic food bowl as it has known to cause skin contact dermatitis around the dog's chin and possibly the face and it is known for leaching contaminants. Puppies may also want to chew on the plastic, which creates ridges that hold bacteria. Interestingly, a research report delivered at the 69th Annual Meeting of the European Federation of Animal Science at Dubrovnik, Croatia found that, when compared to ceramic and stainless steel bowls, plastic bowls had the greatest bacterial count. A stainless steel bowl so far appears to be the best choice considering its ease of cleaning and the fact that it is heavier and less likely to be knocked over. Choose a bowl that is tailored to your pup's size. Water bowl: Your puppy will also be quite an avid drinker. Use the same criteria when picking a water bowl. Skip the plastic, the ceramic and opt for stainless steel. And don't just assume a simple rinse will suffix to clean it out. Stanley Coren suggests at a minimum, cleaning the water bowl with antibacterial dish soap and hot water before filling it up each day, or placing it in the dishwasher to give it a good sanitizing wash.
Dog food bowl and water bowl mats/trays to prevent messes. Pet food scoop so to accurately measure your pup's daily ratio. And of course, your puppy will need training equipment, to get your puppy on a good start. In the past, puppies were usually trained starting at six months, but the truth is, you can start training your puppy as soon as he comes home, yes, even starting at 8 weeks! 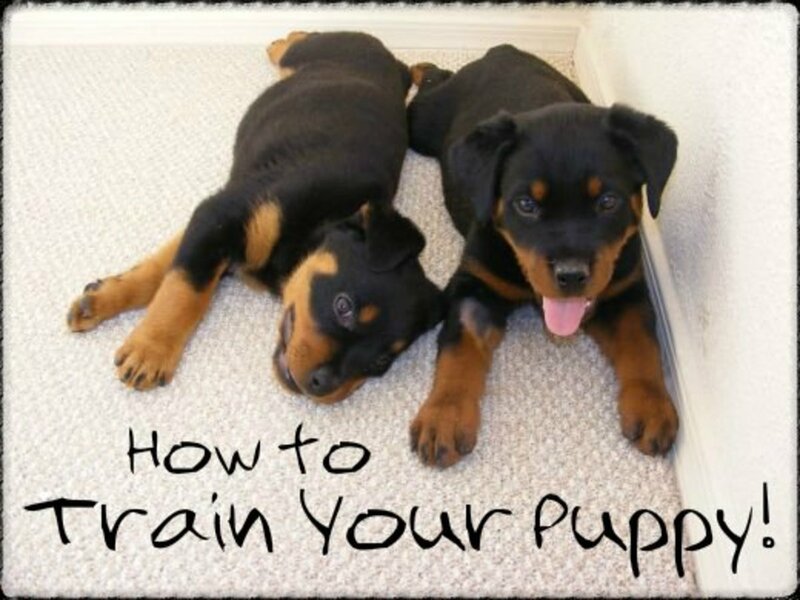 Of course, we won't expect pups of this age to do long attention heeling or long stays as they have the attention span of a toddler, but some easy-peasy exercises such as a "sit " using gentle training methods can come handy already. Also, you want your pup to learn to get acquainted to training equipment and create positive associations with them. 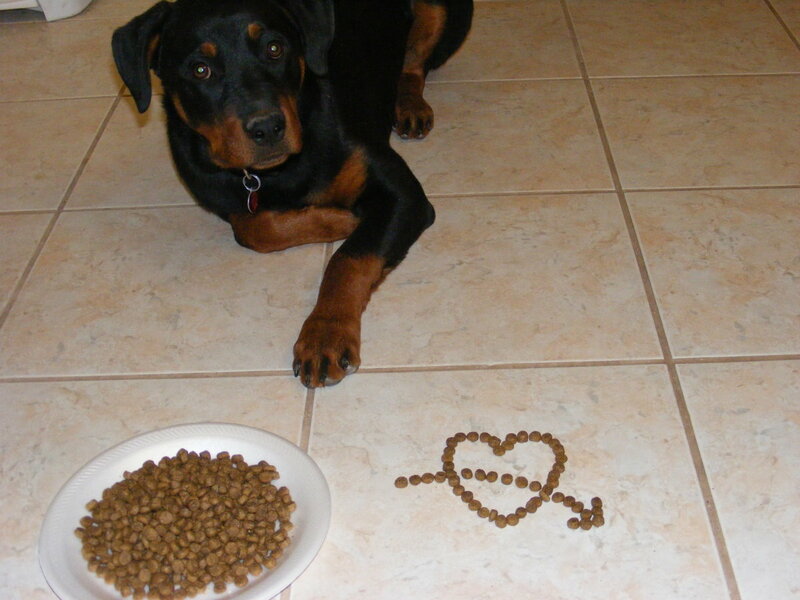 Treats: If your pup loves his kibble, there's good news for you: you can use that for reinforcing desired behaviors. This is a great option because it means less calories, as you can use a generous portion of your pup's daily meal to put your puppy to work for it. However, you may sometimes need something that is higher value than kibble when there are distractions or you want to leave a significant impact for a behavior your pup has learned so well. You can also use treats to stuff some interactive toys listed below to keep your pup busy and his mind stimulated. Dog treats should be given in moderation to prevent tummy upset and should never be used as a replacement for dog food considering that they are not nutritionally balanced. Treats should not surpass more than 10 percent of your pet’s daily caloric intake. When using treats for training, I like to split a treat in several bite-size pieces so to reduce calories. These still work very well to make the point of a job well done! There are many treats for dogs on the market nowadays. Avoid cheap treats that come from China, USA-based treats by popular brands are a much safer option. Look for treats that are appealing to your pup, contain quality ingredients, are moderate to low in calories, consistent in ingredients and avoid discounted supermarket brands, points out veterinarian Dr. Debra Primovic. Some brands are specifically formulated for puppies under 1 year and the best ones are made with premium, all natural ingredients, free from artificial colors and flavors. Treat bag: This is a bag that clips to your belt and that will enclose your tasty treats. Many pups find treats bags irresistible so you may deal with some jumping and attempts to grab it. Use this at your advantage for training good manners: when your pup tries to grab it, place your hand over it and say "leave it" as you turn around and ignore your pup for a few seconds. If your pup keeps "pestering you," leave the room for a bit. Once your pup is calm, turn around or come back, ask your pup to sit and feed him a tasty treat. Teach your pup that he will need to perform behaviors to earn treats and he can't just get them for "free" when it's time for training. If your pup is constantly trying to grab treats, you can keep them in your pocket until your pup learns better impulse control and gets the point that he will get treats only after performing a behavior or an approximation of it. Collar: You want your pup to grow accustomed to wearing a standard buckle collar (preferable with metal clasps versus plastic) so that you can take him to his first vet visits and prevent him from escaping. Using a light-weight one is preferable so that your puppy will be less likely to notice it. The collar is something odd feeling to pups initially and they will often scratch their neck. You can work though on making the collar less annoying. Start by having your pup wear the collar for brief periods of time in the house, while you are playing with him and giving him tasty treats. You can then gradually increase the length your puppy wears it until he seems to hardly notice it. Taking your pup outside while wearing the collar may help him get distracted if you find ways to keep his mind occupied through play, praise and treats. Make sure great things happen when your pup wear the collar. When you take it off, become boring. Your pup will start loving wearing it because of all the positive connotations. While you are at it: get your pup used to collar grabs. You never now that day you may want to hold your pup by the collar to prevent him from getting in trouble. Many dogs grow to resent this and may even try to bite. Teach that collar grabs are wonderful by holding gently the collar with one hand, and feeding your pup a treat with the other. Then, start pulling gently the pup towards you to allow him to have the treat. You know your pup starts loving collar grabs, when upon you touching the collar, he looks at you for his treat. Congratulations: you have now attained a conditioned emotional response! 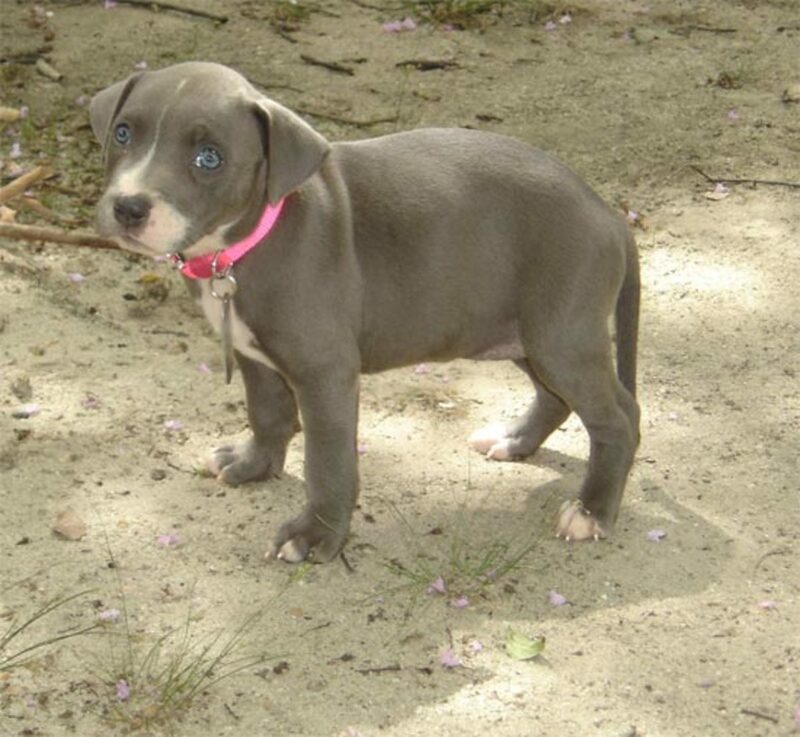 As your pup grows, you will have to regularly adjust the size of his collar. Check it frequently for a proper fit. You should be able to slip two fingers comfortably underneath it. Collars should be worn only when you are supervising. Don't place your pup in the crate when he's wearing a collar as it can get stuck and be dangerous. Avoid having pups wear collars also when playing, there have been cases of collar strangulation as one pup gets his jaw stuck on it. Never leave your pup unattended when wearing a collar. A breakaway collar though can be an option as its made to snap off if it ever gets caught. Leash: Your pup will have to get also gradually accustomed to the leash. Avoid retractable leashes as these are known to cause injuries and teach puppies to pull, as every time they pull, they are rewarded by the leash extending. 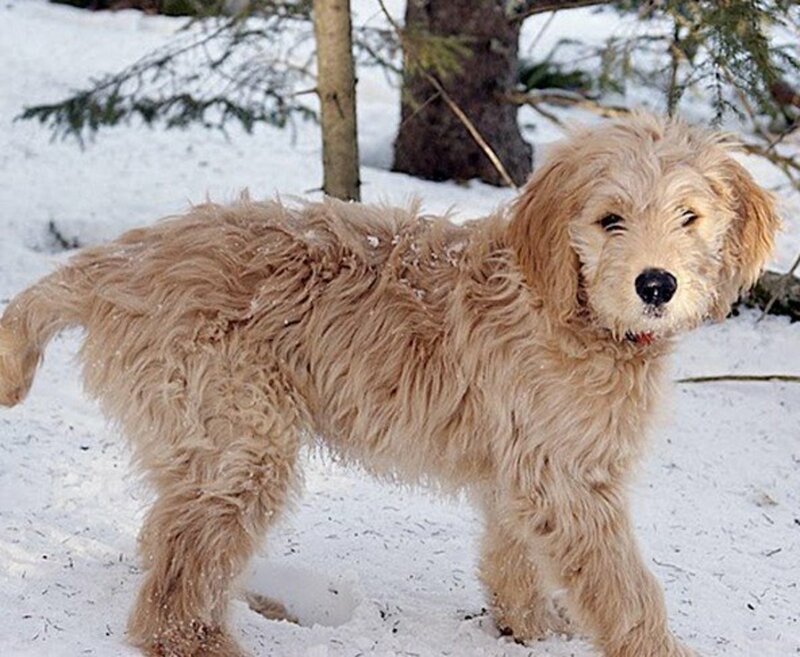 For now, that your pup is young, you may just need a lightweight nylon or cotton leash. Later on, when your pup grows you can invest in a leather leash. Leather leashes, although costly, are very durable (we still have our Rottweiler's leather leash 11-years later), and are soft on the hands (don't cause burns as nylon leashes do). Pups need supervision though as they find chewing on the leather appealing and may easily ruin a costly one. To get your pup used to wearing the leash, once your pup is accustomed to the collar, attach it to the leash and let him drag it around as you are watching. Prevent your pup from lying down and start chewing on it. Distract your pup with some fun games or interactive toys. 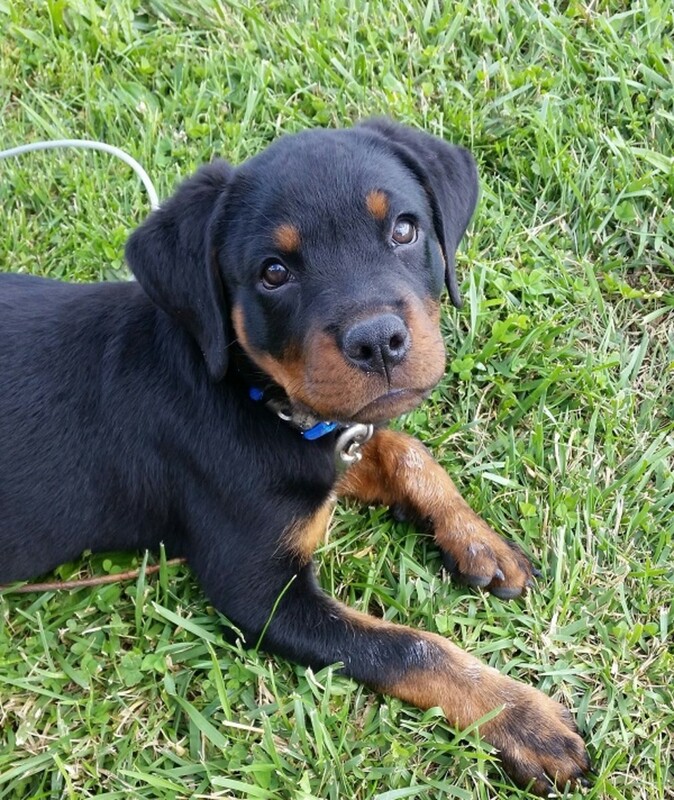 Some pups may get "inhibited" by the leash "chasing them" and may be reluctant to move. Entice your pup to move by tossing a ball to play with it or entice your pup to chase you. Once your pup gets used to the leash being dragged around, you can start getting him used to the feel of "pressure." Teach your pup to "give in" to the pressure by sitting down on the couch and applying very light and gentle pressure on the leash, as you do this, make a smacking sound with your mouth and show him a treat that you will hand-feed. Do this several times. Then, start walking, and every time he lags a bit behind or walks in front and the pressure starts, stop, make your smacking sound and feed him a treat until the leash loosens. Tab leash: A tab leash is a very short leash, usually 4 inches or less that you can attach to your pup's collar. This functions as a "handle" should you ever need to grab your pup without the worry of a long leash getting tangled or caught somewhere. It can work as an intermediate step in getting your pu used to wearing a leash. As with the collar, make sure you condition your pup to grabs. Harnesses: These work best for small breed puppies and dogs who are prone to collapsing tracheas. They may take some time to get used to wearing considering that there are straps that must go around the pup's neck and tummy. A front-attachment harness (leash that attaches to the front ring in the middle of the chest) is preferable than one with the leash that attaches to the back as these latter can encourage pulling. Martingale collar: This collar may come handy for certain dog breeds that are prone to slipping out of a collar. Dogs breeds such as borzoi, whippet, saluki and greyhounds have heads that are smaller than their necks and therefore can easily slip out of a collar. A martingale collar may work in this case as you pup develops, but ask for help if you are not sure whether this type of collar is right for your pup. Many pet stores now have trainers on hand who can help you make the best decision when it comes to collars and leashes. Avoid collars that elicit pain and negative associations (choke collars, prong collars, shock collar);. Clicker: A clicker is a sound-making tool that marks desired behaviors. The click sound tells your dog: "yes, that's correct, now a treat is coming!" Its main advantage is that is allow cutting-edge precision without the fluctuations of our voices. There are many great books on clicker training nowadays. Long line: This can be found in some pet stores, but many horse tack supply stores sell these as they are often used in horses. Long lines come in different lengths (10 to 50 feet). Pick one that is not too long and not too short and use it for training your puppy some fun recalls. Don't forget to praise and reward your pup for voluntarily checking-in with you when he's exploring the yard on a long line! ID tags: There are many types of tags nowadays offered in different shapes, sizes and colors. Many dog owners (and pups) though are annoyed by the jingling sound. I have seen pups and small dogs who find the noise aversive. There are several ways to prevent the sound by attaching the tag to the collar with a rubber band, taping tags together or placing them in a soft pouch. An alternative is having the collar engraved with the dog's name and owner's address and phone number. Microchipping your pup is another option if you are afraid he may get lost, but it shouldn't be a substitute for an ID tag considering that not everybody who finds your dog will have a microchip scanner to find your information. Books: There are many great books for puppies out there! Ian Dunbar of Dog Star Daily offers free downloads online in Pdf file of his "Before you get your puppy" and "After you get your puppy." 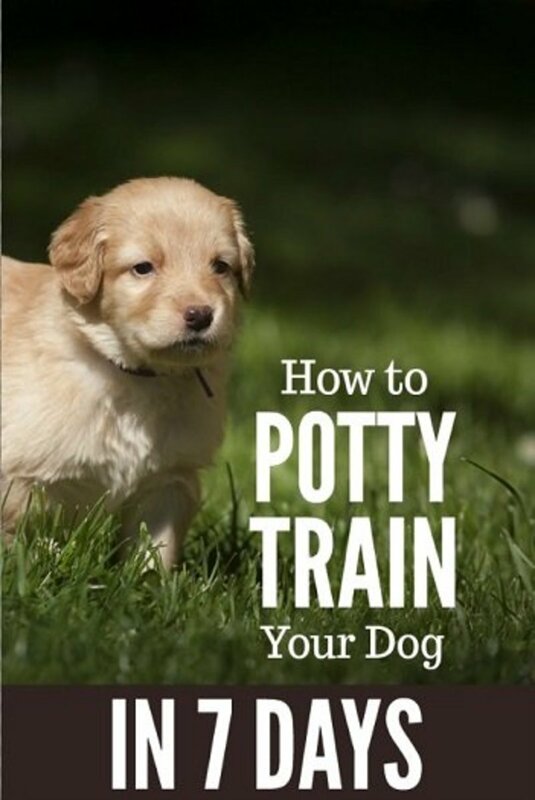 There are also many wonderful books on successful potty training for puppies. Make sure that the books you choose emphasize the use of positive, humane dog training techniques. Interactive Food-Dispensing Toys: These work great for several purposes: they keep your puppy busy and mentally stimulated, they can be used to redirect your pup from nipping your hands and feet, they can help teach your pup to 'trade" should your pup get a hang of something he shouldn't have (shoe, slipper, remote), and they can help your pup cope with being left alone in the crate, behind a baby crate or in any separate area. Examples of favorite food-dispensing toys include the classic Kongs, Buster Cubes and Kong Wobblers. Baby gates: These are great for management. Say you have to mop the floor and don't want your puppy around or you have nit-picky guests who don't want your pup to engage with them. You may find baby gates helpful as well if you have a baby or have other pets in the home and don't want them to be pestered by the pup. Some baby gates have a small opening at the bottom through which a cat or small dog get easily get through but a large dog cannot. A baby gate works well for also blocking off stairs and other off-limit areas. Mat/blanket: You may want to skip expensive bedding for now as your pup may likely shred it to pieces and remove all the stuffing. He may accidents on it too. A mat or blanket may work for now. Of course, avoid blankets if your pup has a tendency to rip things apart and ingest parts, which can lead to potentially dangerous intestinal blockages. Chews: Puppies who are teething may look forward to chewing certain items. You can redirect your pup by offering a food-dispensing toy or some edible and non-edible chews sold in pet stores. Make sure they are suitable for puppies as puppy teeth may be prone to fractures. An economical solution is to wet and twist a clean, never-used-before wash rag, freeze it and then offer it to a teething pup to get relief for those sore gums. Fetch toys: These are toys purposely made for playing fetch. Not all puppies will learn to readily play fetch, but some may be more predisposed to enjoy this game. To prevent a fetch toy from getting chewed on and played with inappropriately, keep custody of it and use it only for fetching. Tug toys: Playing tug with pups is OK as long as you make some rules to follow, use the toy properly (avoid super-strenuous pulling or lifting your pup attached to the toy) and use the right tug toys so not to damage their tiny teeth. Make sure you keep custody of the toy and that you are always the one to initiate play. Plastic crate: A plastic crate comes handy for traveling and can be used as well as every day crates to use. If you have a wire crate in the bedroom, you can keep a plastic crate in the living area that can be used as well for travel. Adaptil DAP diffuser/collar: These diffusers release a synthetic form of dog appeasing pheromones which can help pups calm down and adjust to new environments. Use the diffuser the first days pup comes home and the collar for new car rides. Car safety harness: This harness wraps securely around the dog's body allowing some movement, but preventing him from roaming unsafely around the car. Comb: Give your pup a treat for sniffing the comb, and then feed kibble/treats as you pass it through the coat to make it appealing. Go gradual and for brief periods. Brush: Same here, create positive associations with being brushed. Puppy shampoo: Look for a tear-less one that is gentle and suitable for puppies. Nail clippers: Have your vet show you how to clip nails so to prevent cutting the quick which can make your pup fearful of future handling of his paws. Create positive associations. Toothbrush/toothpaste: Did you know that 80 percent of dogs over the age of 3 have periodontal disease? Good oral hygiene should start early. Train your puppy to have his teeth brushed. Most pups will enjoy this if you go gradual and it sure helps the fact that toothpaste for dogs comes in many tantalizing flavors (chicken, peanut butter, vanilla). 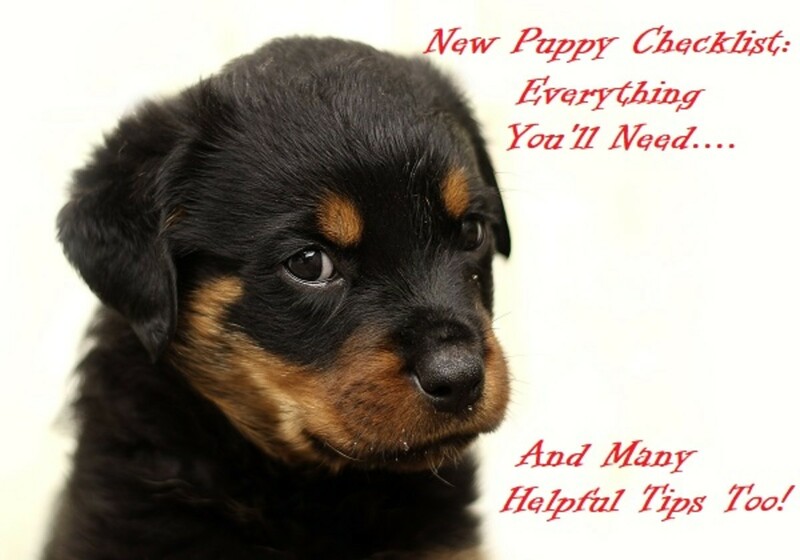 So there you have it: a new puppy checklist that should have everything you need and much more. Worthy of adding are just a few important pointers: Make sure that your puppy is socialized during his critical socialization period but that you also limit exposure to potential infectious diseases by preventing interactions with non-vaccinated pups or frequenting places where many dogs gather (dog parks, pet stores). Work with your vet to discuss your pup's risk of exposure. Finally, avoid heavily exercising your pup especially on hard surfaces (cement or asphalt.) and avoid enrolling in dog sports too early. Conditioning too early for a puppy may result in trauma to his growth plates, warns veterinarian Dr. Wendy Baltzer. You certainly covered a lot of territory with regard to what is necessary when taking on the responsibility of raising a puppy. We learned the necessity of buying a crate after we had many things destroyed. Dogs eventually love going into their crate. Even after we removed it when our dog was fully housebroken, one of our dogs always chose to go to the same spot where the crate had been located when we would leave the house. Good article for those people who do not realize all the things needed when bringing a puppy into the house. 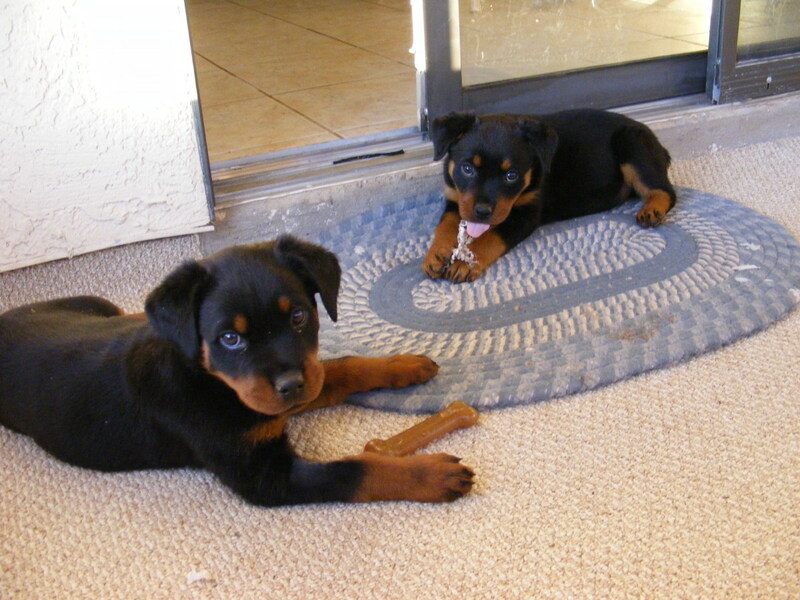 Thanks, my Rottweilers are in some of the pics when they were babies. We spent a fortune on new puppy supplies when we first got them between crates, food, treats, collars, leashes but it was all worth it in the long run and we still have some supplies that turn handy still as of today.